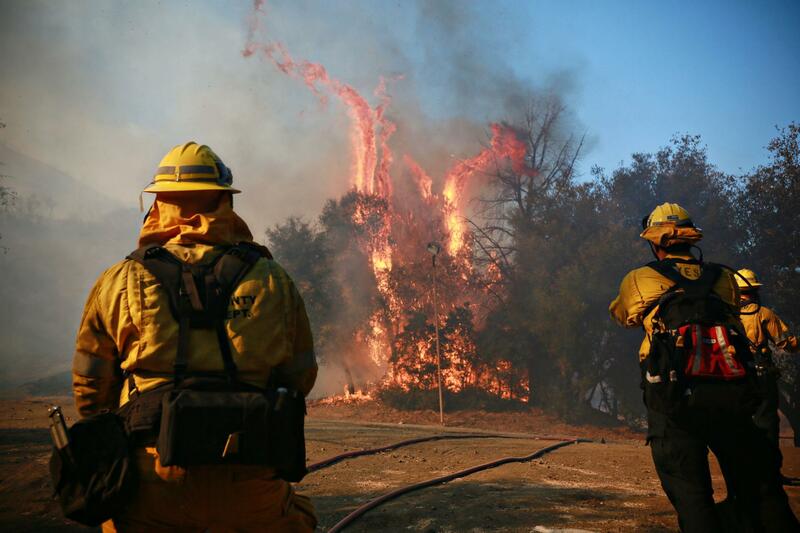 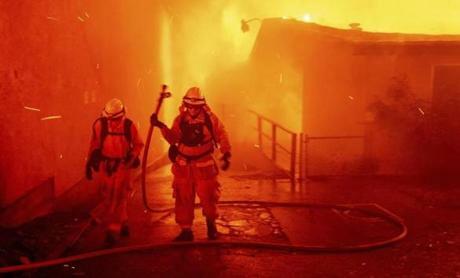 Firefighters battled a blaze at the Salvation Army Camp in Malibu, Calif. 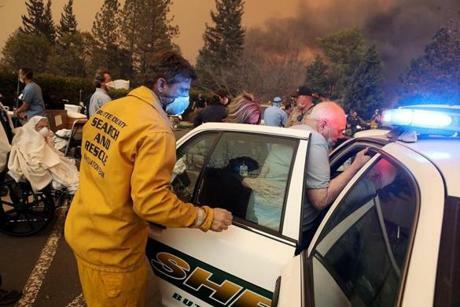 Firefighters watered down trees and bushes near homes on Bell Canyon Road in West Hills, near Malibu, Calif.
Yuba and Butte County Sheriff officers loaded a body into a hearse in Concow, Calif.
Vehicles and homes burned as the Camp Fire tore through Paradise, Calif.
A hospital worker embraced her co-worker as they evacuated patients from the Feather River Hospital. 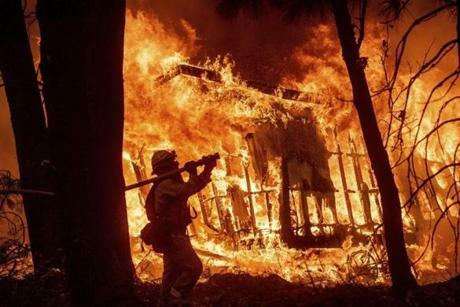 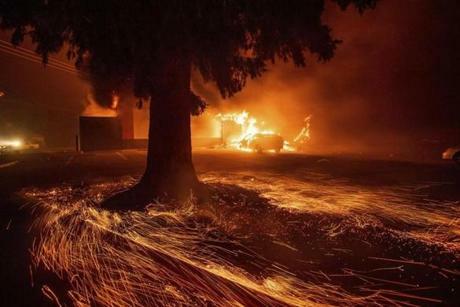 Firefighter Jose Corona sprayed water as flames consumed a home in Magalia, Calif., on Friday. 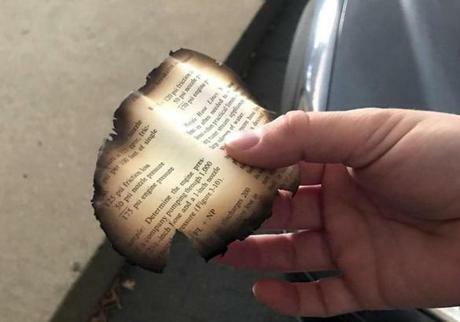 Yuba and Butte County Sheriff officers discovered bone fragments inside a burned vehicle in Concow, Calif.
A home burned as the Camp Fire moved through the area in Paradise, Calif.
A piece of a burned page that fell out of the sky in Chico, Calif.
A burned-out car sat on the side of the road in Paradise, Calif., on Friday. 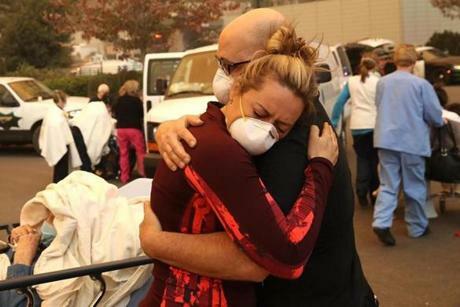 Emergency personnel evacuated patients as the Feather River Hospital burned. 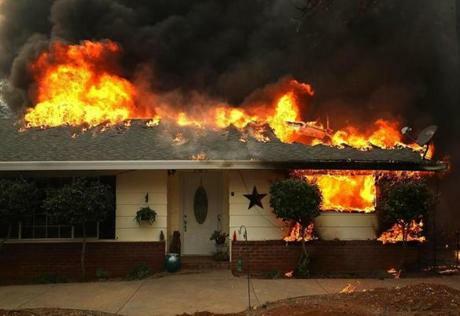 A home burned during the Camp Fire in Paradise, Calif., on Thursday. 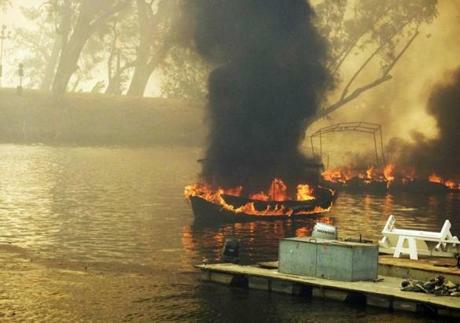 A wildfire burned boats on Malibu Lake in Malibu, Calif., on Friday. 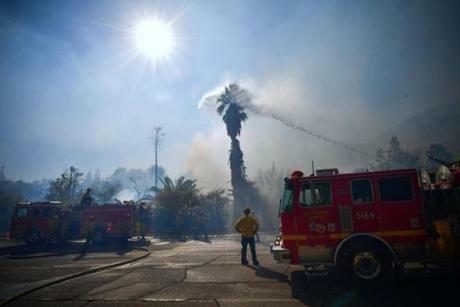 About two-thirds of the city of Malibu was ordered evacuated early Friday. 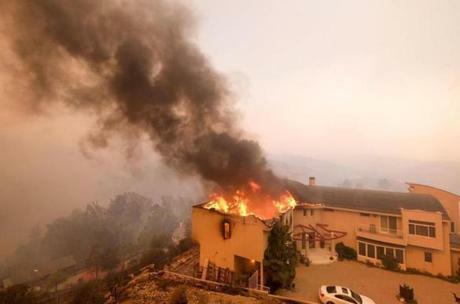 A wildfire burned a home near Malibu Lake in Malibu, Calif., on Friday. 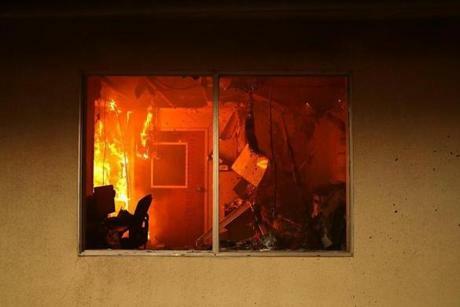 The interior of a building burned as the Camp Fire moved through the area on Friday in Paradise, Calif. 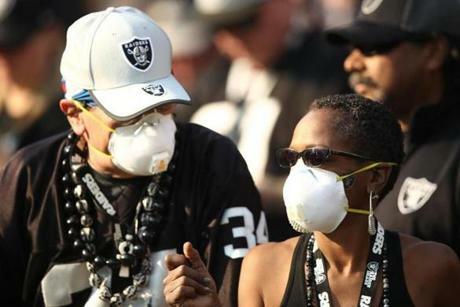 Fans wore face masks in the stands during the NFL game between the Oakland Raiders and the Los Angeles Chargers at Oakland-Alameda County Coliseum. 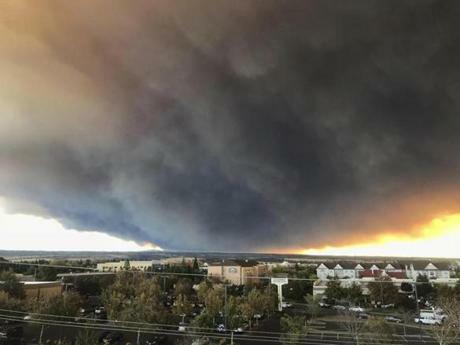 An Air Quality Advisory was issued due to heavy wildfire smoke in parts of the Bay Area from the Camp Fire in Butte County. 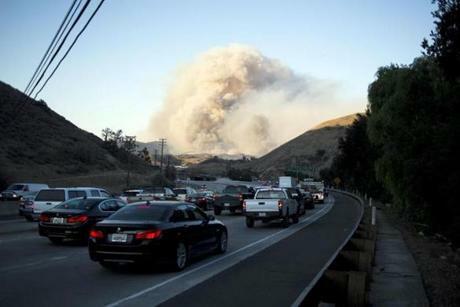 Smoke from the Woolsey Fire loomed above Highway 101 in Thousand Oaks, Calif.
A home burned as the Camp Fire raged through Paradise, Calif., on Thursday. 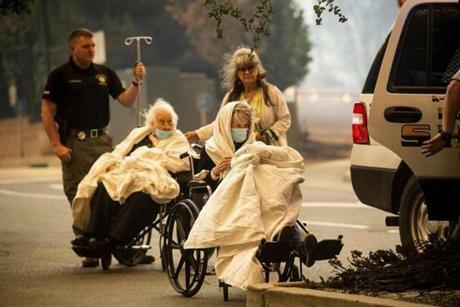 Hospital workers and first responders evacuated patients from the Feather River Hospital as the Camp Fire moved through the area on Thursday in Paradise, Calif. 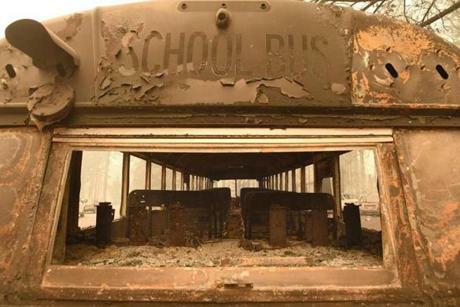 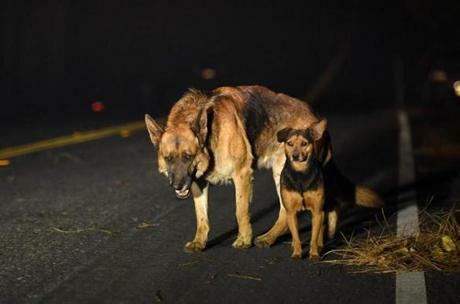 Dogs roamed burned-out neighborhoods as the Camp Fire tore through Paradise, Calif.
Flames burned inside a van in Paradise, Calif.
An abandoned burned-out school bus sat on the side of a road in Paradise, Calif. on Friday. 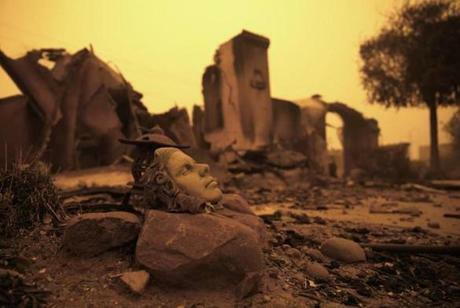 Flames consumed a Kentucky Fried Chicken in Paradise, Calif.
A piece of art sat outside the burned remains of a home on Friday that was destroyed by the wildfire in Paradise, Calif. 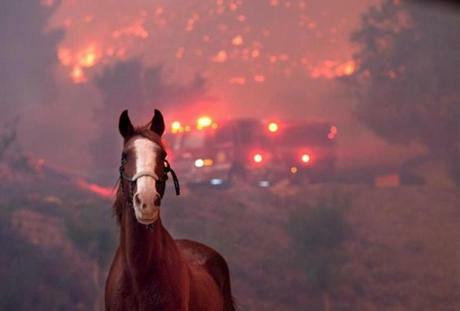 The Woolsey Fire burned towards Paramount Ranch on Friday in Agoura Hills, Calif.
Horses were spooked as the Woolsey Fire moved through a property on Cornell Road near Paramount Ranch on Friday in Agoura Hills, Calif.
A home burned as the Camp Fire moved through the area. 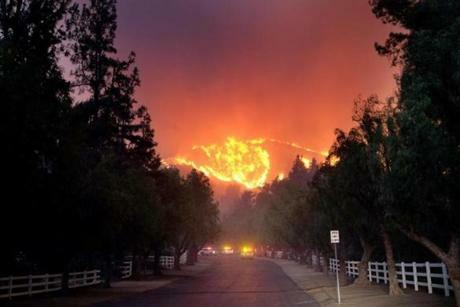 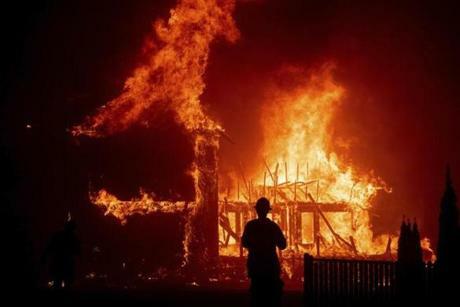 Firefighters tried to keep flames from a burning home from spreading to a neighboring apartment complex as they battled the Camp Fire on Friday in Paradise, Calif.
A charred animal lay on a roadside as the Camp Fire tore through Paradise, Calif. 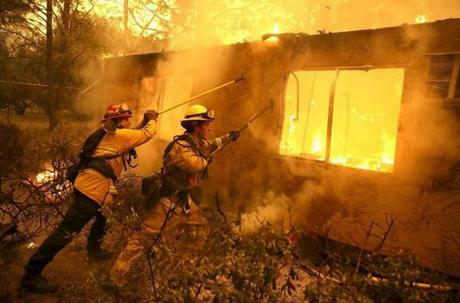 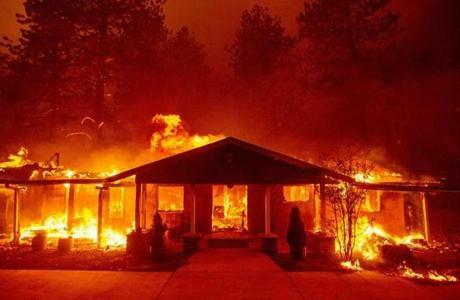 Firefighters battled the Camp Fire as it tore through Paradise, Calif. 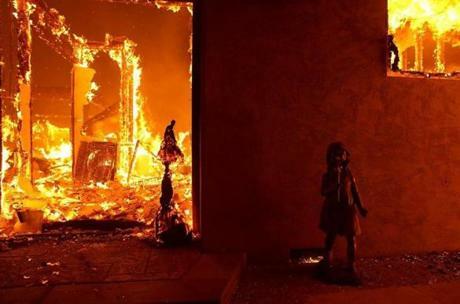 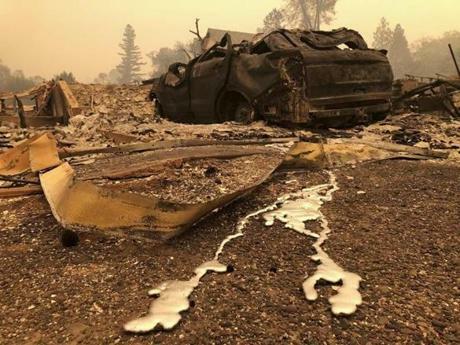 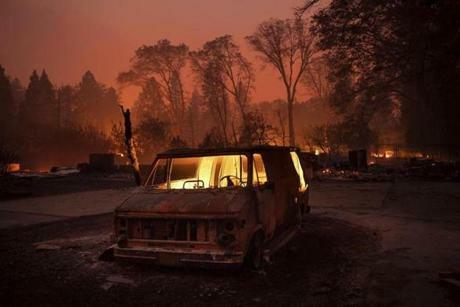 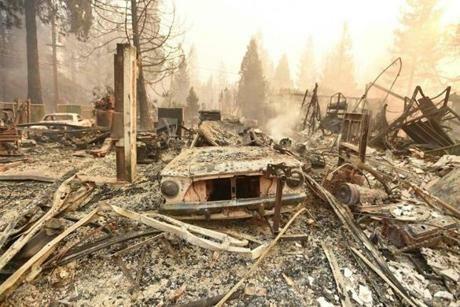 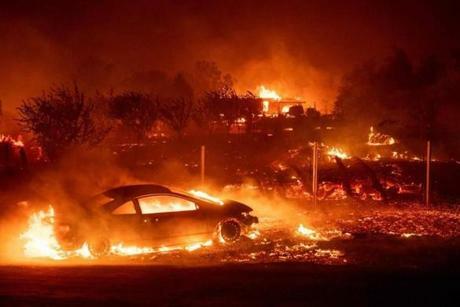 The burned remains of a vehicle and home were seen during the Camp Fire in Paradise, Calif. 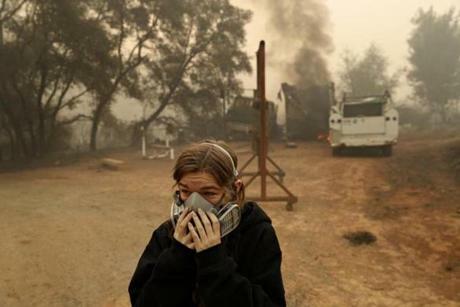 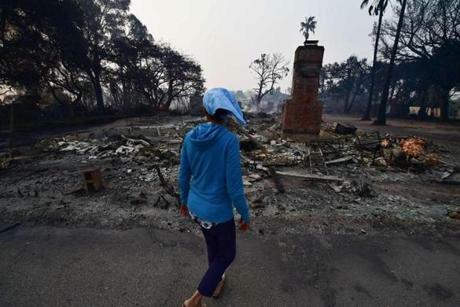 The massive plume from the Camp Fire, which burned in the Feather River Canyon near Paradise, Calif.
Araya Cipollini cried near the remains of her family's home on Saturday in Paradise, Calif.
Local resident Lea Johnson viewed the scene Saturday after fire tore through the Point Dume neighborhood of Malibu, California overnight. 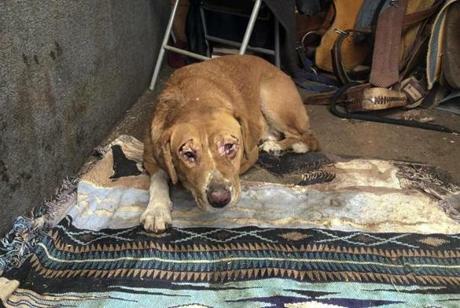 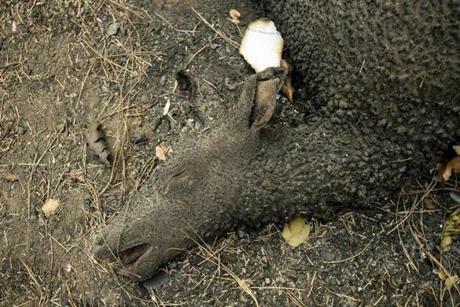 Shiloh, a 2-year-old golden retriever, had its face burned after a wildfire in Paradise, Calif., on Saturday.